That's a lucky find, Andrea. I collect green stones and there aren't that many to find here in the Netherlands. I send you lots of love as well, for Valentine's Day and always. What a gorgeous rock! I am not surprised at all! Hope your day has been filled with tons of love and happiness! Happy Valentines Day! I have a rock just like that one. Mine is crack free. I think a cracked heart is better though. A crack in the heart shows that you've been alive. "....and an island never cries..."
Beautiful shape from nature. Hope you had a wonderful Valentine's Day and thank you for your nice comment on my blog! I hope you find heart shapes in many things today and every day! Nope not suprised! Wishing you many more heart shaped rocks! Oh, this is so beautiful! I love it. Thank you, Andrea. right back at you! Great shot of this heart-shaped rock with the shadow behind it and the colorful tiny pebbles on which it lies. The cracks are perfect... theyrepresent the scars from each time a heart is broken. 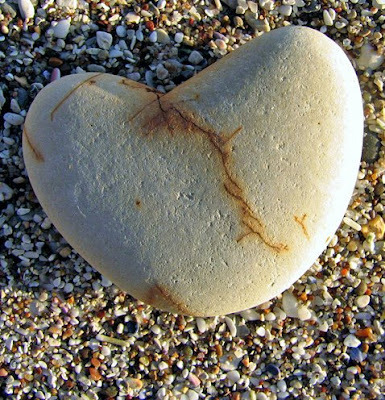 I never realized there are so many heart shaped rocks in the world.....I must get a move on finding some before you guys here collect them all! Check out Euro Cup Live Scores to know everything about Euro Cup 2016,which is due to start on 10th June in France and also watch all the matches live.